The name Ot-Wa Taiko, while phonetically reflecting its community of origin, also uses the Japanese characters oto ("Sound") and wa ("Harmony"), along wth the world taiko ("Drum") The group will be performing later this year in Japan. Composed by Oto-Wa Taiko, Shunpu is a complex piece which features an original song and three diffrent time signatures. The dynamic rhythms and the drummers' movements echo the vivacity of nature, with images of plants and other lifeforms emerging in a display of energy. 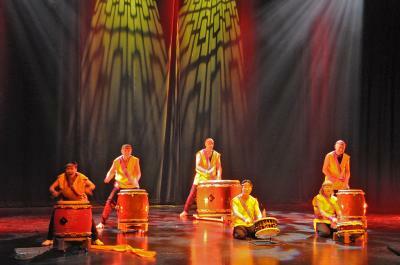 Saru Asobi, composed by Oto-Wa Taiko, is reminiscent of a group of monkeys at play, and features unusual choreography, including a surprise ending.